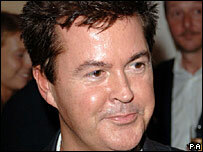 Former Spice Girls manager Simon Fuller says he is developing a TV fashion show for ex-Spice Girl Victoria Beckham. "It will be more serious than a reality show but will still be entertaining because Victoria is so funny," he told Broadcast magazine. Fuller, who manages both Victoria and David Beckham, is responsible for the hit shows Pop Idol and American Idol. In the interview, Fuller, 46, said he was also planning a sitcom based around another former Spice Girl, Emma Bunton. "Emma wants to get into TV," he said. "She went to drama school and it's in her blood. We're going to give her a shot." Fuller has also been approached by comedians Matt Lucas and David Walliams to develop Little Britain for the United States. "We are on the brink of confirming something rather special," he told Broadcast magazine. "Comedy of that quality always crosses the Atlantic." Fuller has said he specialises in "creating fame and celebrity"
Fuller began his career by identifying up-and-coming talent for record company Chrysalis. He named his company 19 Entertainment, after the 1985 number one single by Paul Hardcastle, whom he discovered. Although Fuller did not bring together the Spice Girls, he secured the record deal which would see their debut hit Wannabe top the charts in 37 countries. He also launched pop group S Club 7 and then doubled his fortune with the TV talent show Pop Idol. In 2003, he sued Pop Idol judge Simon Cowell, saying his ITV1 show, X Factor, copied the Pop Idol format. Fuller dropped the lawsuit in return for a stake in X Factor, but now says he thinks TV talent shows have passed their peak. "There have been too many talent failures this year. It's been carnage," he said. "People have lost a lot of money. I think it's time to move on."